Symbolism: The Angels are seen alongside lovebirds, a symbol of the miracle of love. 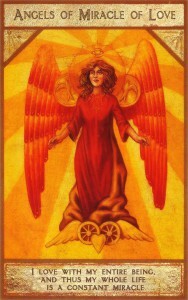 The winged wheels of fire are symbolic of the Seraphim themselves. The eye at the top represents the symbol for the Heaven of Paradise. The heart at the bottom and the open hands stand for the longing for real love which all of us share. Angelic function: To bring miracles into our lives. Gifts for human beings: They can help you to open yourself to receiving the love you desire; cherish the love you have in your life; acknowledge the miracle of love from the Source. The Angels of the Miracle of Love offer each of us the possibility of knowing God’s love in a deeply meaningful and intimate way. For one it may be through parenthood, for another it may be in a spiritual or therapeutic community of brothers and sisters, for yet others it may come through a deeply personal relationship. We are each given the possibility of the miracle of love, and as unique individuals we will be offered the gift of God’s love in unique ways that are perfect for us. Our choice is to open our hearts so that we may be receptive to that love. When we choose love in our lives the angels embrace us and fill our hearts with the grace of Divine love.This miracle of love is best expressed through human interactions; for love that is holy offers its most beautiful reflection in our relationships with one another. We can offer up our prayers to The Angels of the Miracle of Love to bless us with this most precious gift in our life. We can be receptive and clean of negativity so that our capacity to cherish and preserve this love and let it grow is constantly expanding. Love is so precious; it is our greatest treasure. In whatever form it comes we can cherish it, mindful not to take it for granted or treat it abusively. The clearer we are in ourselves, the less we will sully or expose this gift to the wrong energy. Love is so special that we can only honour and thank the Source for the experience of it. As we stay clean, working on ourselves, taking responsibility for our projections and maintaining a positive attitude, we become more and more capable of receiving God’s love. Miracles are given freely by the Holy Spirit. They are available to everyone. The only thing which is asked of us is to be ready to receive them. We are asked to purify our hearts and open our spirits to receive the gift of the miracle of love. We can pray to The Angels of the Miracle of Love to be our guide as we become aware that this is what we truly long for in our lives. To know the love within us is also to know the love which is around us. God’s love has no limitations or boundaries. It permeates all living substance and can be experienced in everything.